Although I resolved to start running, I haven't yet. So I spent the weekend biking indoors (too cold on Saturday) and then biking outside on Sunday and doing trail work. That was my Saturday exertion. I was a bit tired after I was done. On Sunday, I did a little over two of hours of trail work at Briar Chapel. We were building up a berm so I shoveled a lot of dirt. After we finished up the berm we went for a bike ride at Briar Chapel. This time I brought my singlespeed because I still had my Blur on the bike trainer and didn't have the time or motivation to take it off the trainer and reinstall the rear wheel. I use every minute in the morning to dawdle and this would have caused me to be late (and I was already 5 minutes late getting there). The singlespeed was not too bad but my legs were tired on the climbs and I couldn't make it up Bennet Mtn without walking a bit. Still it was a good 8 mile bike ride and Sunday turned out to be quite warm (60 deg). I wish I had had the energy to do two laps but it just was not there. 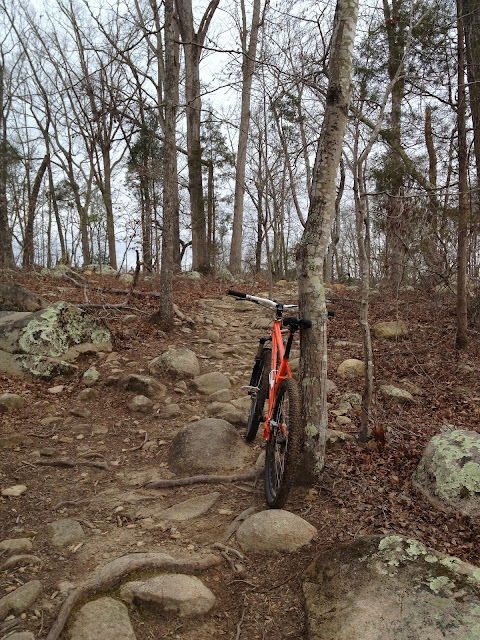 So January 5th was my first mtn bike ride of the year! 73 lbs 4 reps + three assisted reps with Jason's help! 125 lbs 5 reps, I tried a 6th rep but I couldn't even get below parallel! I was done for the day. I have to keep reminding myself that at least I'm moving forward with the weights but it's a little disheartening when it feels like I'm struggling. I definitely don't feel like I'm as fit as I want to be, but I know I need to work on every aspect to get there: diet, mobility, drills, and consistency in working out! It went back to being freezing cold again so probably no bike night ride this week, just more happy time on the bike trainer! I have finished one week on the James Wilson XC Endurance training program, now I'm entering Week 2. I'm making an effort to keep track of my heartrate during the workouts and an estimate of how I feel on the trainer and on the bike. I don't think I'll know if this is working for at least another 8 weeks though.